Hammersmith & Fulham Council is leading the crusade against the “forest of estate agent boards” that can litter streets if not kept in check. Residents are being asked to report illegal estate agent boards to a new dedicated email address – boards@lbhf.gov.uk – and local estate agents are being invited to a specially arranged summit paving the way for other local councils to follow suit. Last year H&F council acted in two areas of the borough after inspections in 15 streets in the Barons Court and Sinclair Road/Gardens conservation areas revealed over 300 estate agent boards on display. In one instance, there were nine boards on just one property. Following approval from the Secretary of State, H&F Council introduced a clampdown, preventing boards from being displayed within these two problem areas. The recent evaluation carried out showed that the ban was a success say the Council. Local estate agents have been invited to a summit, to be held at Hammersmith Town Hall on 13 November, to discuss the situation with councillors and council officers. 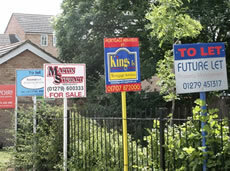 Cllr Botterill said, “When we introduced the ban last year, the response from estate agents was actually very positive. “They were happy to fall in line with what we were trying to achieve as the clampdown meant a level playing field for all of them. Ultimately, it is not in the interests of anyone, least of all estate agents, to have the borough cluttered with unattractive boards that make H&F a less desirable place to live. “We found that as a council we didn’t need to dedicate a great deal of resource to policing last year’s clampdown as estate agents complied very quickly and were not prepared to be seen as the rogue agents flouting the ban. It’s obviously not good for business to garner that sort of reputation. H&F Council is encouraging residents to email boards@lbhf.gov.uk or phone the planning enforcement team on 020 8753 3483 if they spot illegal boards in their neighbourhood.